What do you get when you mix the Cinderella and Sleeping Beauty fairy tales with a wand-wave of Disney’s live-action Princess Diaries? 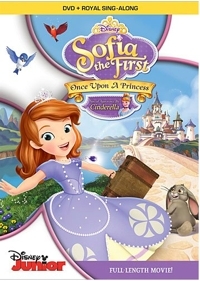 Well, if you use Playhouse Disney-style CGI animation and gear it toward preschoolers, you get Sofia the First: Once Upon a Princess, the 48-minute pilot for a Disney Junior TV series that drew 5.2 million viewers when it first aired. Disney took some heat over a character who may or may not be Latina enough, and of course there came the usual outcry that it’s yet another attempt to indoctrinate little girls into the princess mindset, training them to be lifetime believers in the dream and consumers of the product tie-ins. But let’s not forget that fairy tales have been around since the 1600s, and at least Disney has refined the lessons to be learned so that they include such positive values as independence, determination, hard work, kindness, generosity, poise, and being true to oneself. 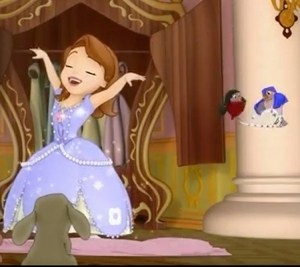 Given the intended audience, Sofia the First offers surprisingly detailed backgrounds and objects, with fully sculpted characters that are a delight to watch. Yes, the plot is as familiar as the whole princess thing, but it won’t seem unimaginative to the little ones. In fact, Sofia the First is well done enough to make it non-torturous even for parents who watch alongside their children. That goes for the songs, too. It begins with a happy ending: a commoner (Sara Ramirez) marrying a king and becoming queen. But this particular commoner is a single parent, like the king, so they face a situation common to people everywhere: the blended family. As King Roland II (Travis Willingham) tries his best to make stepdaughter Sofia feel welcome and special, he unwittingly brews resentment in daughter Amber (Darcy Rose Byrnes) and son James (Zach Callison). It doesn’t help that the king has asked her to dance the first waltz with him at the ball. That leads to trouble for Sophia, as she tries to learn what it takes to be a princess, both in the palace and at a special school for royals. Adding to the mayhem is a sorcerer (Jess Harnell) who’s comic enough for “relief” but ambitious enough to be the bad guy. Telling the story and serving as Sofia’s guides are the three fairies from Disney’s Sleeping Beauty—Fauna, Flora, and Merryweather—and parents will smile as they recognize fashionista Tim Gunn as the voice of the butler Baileywick. Sofia the First is directed by Jamie Mitchell, who received a Primetime Emmy nomination for Winnie the Pooh & Christmas Too (1991). It should be a hit with children ages 3-6.